Yesterday, 12 of our players crossed the Severn to take on Wandering Star B.C. 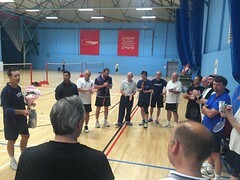 in the fourth Annual Pink Shuttlecock Tournament. 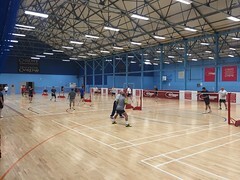 We played against 10 of their players at Cardiff University's Sports Training Village - a really nice venue that must be able to support at least 15 badminton courts across their 3 sports halls! 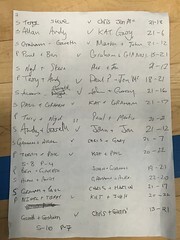 It was great to have so many players competing from both clubs which meant that at one point we had 5 courts on the go - curse those other bookings kicking us off! Despite the Welsh rain doing its best to put a downer on the day, we all had a fantastic time, playing a whopping 54 games in 3 hours! 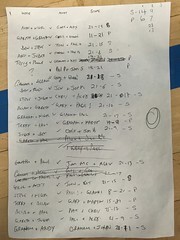 Unfortunately we weren't able to bring the pink shuttlecock back to Cheltenham, "just" being pipped to the post with a final score of 34 - 20. 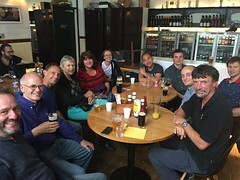 Luckily however, there was plenty of food, drink (and more rain) to drown our sorrows in afterwards. We were pleased to be able to join Wandering Star in thanking Geof, who had recently stood down as their treasurer after holding the role for many years. On behalf of our club, Paul P presented a "replica" pink shuttlecock trophy (although the original successfully made it to the restaurant, it accidentally got left in the car and sent home again, luckily we were prepared and had a backup!) to Wandering Star in recognition of their 4th tournament win. A big thank you to Ben and the rest of Wandering Star for organising and hosting the tournament, and of course to all the players for making the journey to compete! 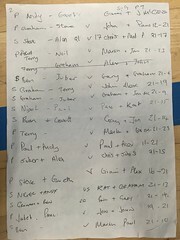 A few photos of the event and the score cards can be seen below. More photos are available in our photo gallery. We'd love to have more of our players getting involved so that we can keep growing the tournament, so keep an eye on your inboxes for details of next year's tournament as it will be our turn again to host it in Cheltenham.